Recently during la passeggiata I was talking to a friend who asked me if people in the US meet out in the piazze and streets to talk everyday. My first response was “Obviously you’ve never been to America”…piazze are hard to find. America has not been a land of meeting in the square or on the street for many years, it is becoming a land of suburbs and malls. Every Italian city has a daily flow of people through the piazza going to work, out to buy the day’s groceries or just to meet some friends and have a caffé. This flow has high and low points based on the time of day when i cittadini are at home for a meal. Trivigno is no different from any other Italian town in this regard. I do think it is different in that everyone knows everyone else. Either they are related in some way or they have known each other since they were kids. One contrast I have noticed to larger Italian cities is that here everyone greets everyone else, usually with the informal “Ciao”, even if you just saw them five minutes ago. I now notice the contrast with the cities where not everyone will look at you and greet you. It did not take long after we settled in when we started being greeted by everyone. Young, old and every age in between. It sure makes it feel familiar. When people gather for a caffé, to share a beer or for a social event there is always a mix of ages, there is minimal separation by generation. 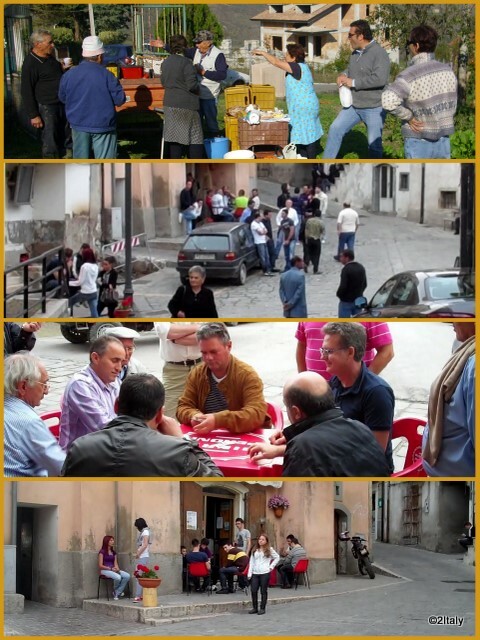 We might have a caffé in the morning with the local Carabinieri captain, an afternoon caffé with the supermercato owner and a beer in the evening to watch some calcio with a mix of people from pensioners to members of the youngest generation. There is little noticeable separation between ages or “classes” of people; we are all in the mix together. Returning home to the US this is some thing that I really miss-that sense of camaraderie and seeing neighbors and friends every day. People here rarely say hello when you pass them on the street! Delightful post! Brings back memories of experiencing this interaction. An image comes to my mind of an elderly woman who didn't have the energy to actually walk the street so she put her chair in the doorway to her house that was right on the street and sat there as people walked by and they always greeted her and included her in the camaraderie. janie - Our experience also in the US, especially in Northern VA.
Patricia - I can just picture that scene. There are several elderly folks here who make it to a bench and talk to whoever comes along.